Home / UncategorizedA Beautiful Eco-friendly home !! In recent times there has been an improving global awareness and concern for the environment. We have begun to take into consideration not only the health and sustainability of the natural environment, but also become more aware of our environmental footprints in our cities and our homes. As a result, ecological houses are becoming more common and are being explored as genuine alternatives for people to live in. These ecological houses are built in a wide variety of forms and their designs are becoming more and more inventive. 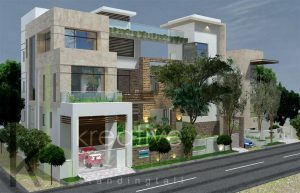 Take a look of this ECO friendly house designed by kreativehouse architects based at Hyderabad and Pune. This home has been designed in such a fashion that it allows maximum inflow of natural light. This light eliminates the need of artificial light which eventually saves power and electricity. In underdeveloped and developing nations where electricity has still not reached every household, we must do our share in saving electricity for the poor and the needy. The ample glass windows in this house not only adds to the overall look but also allows heat from the sun and keep the house warm from the inside as well. An outdoor balcony area has been designed to enjoy a morning coffee outside. And the solar panels are used to save power and electricity. They are installed on the top of the roof which will harness maximum energy from the sun rays and supply hot water without the use of geysers and water heaters. Rainwater harvesting systems has also been used, wherein we can store the rainwater and use it for everyday routines such as flushing the toilet and watering the garden. For the exterior building elevation natural stone was used, which is environmental friendly building material. The trees around the building are making this house a complete eco friendly Home. Making your home more eco-friendly can be rewarding in many ways. Not only does it provide environmentally conscious solutions to problems such as power cuts and water shortages which are commonplace in India, it also allows us to feel more connected to nature. An eco-friendly home addresses more global issues such as environmental destruction and global warming as well. Need help for you next design project?? ← Luxury Building design ideas!